Under normal conditions, hair grows out of the follicle and should push through the skin. However, sometimes hair can fail to push through the skin and grow into the skin, creating an often visible bump under the skin. Although Ingrowing hairs aren't usually a serious health issue, they can result in bacterial infections if the patient picks or scratches at the Ingrowing hairs. They can be itchy and leave the skin feeling very rough. They can also be very damaging to self-confidence, leaving marks and scars on the skin. 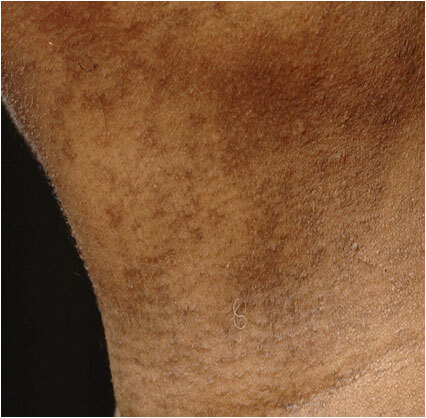 Although Ingrowing hair or Ingrown hair often resolves itself in time it can cause significant problems, especially of unsightly pigmentation in people with darker skin tones. 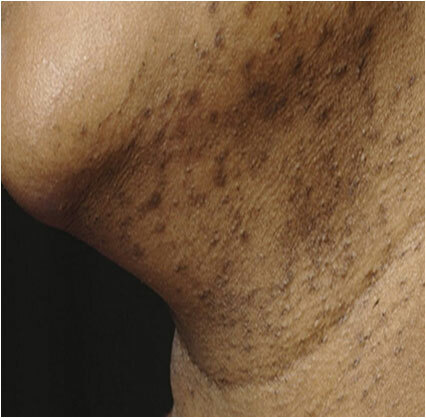 Ingrowing hair or Ingrown hair is most common in men, on the chin, cheeks and neck. The problem can also occur in women, however, usually on the armpits, legs or pubic region. Hair follicles which produce curled hairs are more likely to result in Ingrowing hairs or Ingrown hairs . Certain hair removal methods can also increase the chance of developing this problem. Laser hair removal is the only treatment that can get rid of these areas of hyperpigmentation and prevent them from recurring. Laser hair removal for Ingrown hair treatment can help to boost your confidence as well as your comfort. What causes Ingrowing hair or Ingrown hair? Ingrowing hairs or Ingrown hairs are more likely to happen when hair is curly or coarse, which is why it is more common in the beard area or the pubic region. Afro-caribbean hair is also more prone to becoming Ingrown. What are the different types of Ingrowing hair or Ingrown hair treatment available? There is only one treatment available that will prevent Ingrowing hairs or Ingrown hairs and reverse the damage that has already been done: laser hair removal. Even if you don’t wish to have laser treatment to achieve permanent hair reduction, the laser can shrink the hair follicle over time, which will allow you to shave without the risk of Ingrowing hairs or Ingrown hairs. Is Ingrowing hair or Ingrown hair treatment right for me? If you have a persistent problem with Ingrowing hairs or Ingrown hairs and residual pigmentation problems or redness, then shaving should be discouraged and laser hair removal for Ingrowing hair or Ingrown hair treatment is probably a more appropriate option. One of our qualified experts can advise on the best course of action during a consultation. How long does Ingrowing hair or Ingrown hair treatment take to work? That will depend on a number of factors, including the texture and colour of your hair. Most patients have a significant improvement in their Ingrowing hair or Ingrown hair after 4-6 treatments. One of our specialists can give you an idea of your personal treatment schedule after a thorough consultation. Who will perform the Ingrowing hair or Ingrown hair treatment? Ingrowing hair or Ingrown hair treatments are performed by one of our qualified experts and supervised by award-winning dermatologist Dr Maria Gonzalez. How much does Ingrowing hair or Ingrown hair treatment cost? Exact prices to be confirmed during your Ingrowing hair or Ingrown hair treatment consultation.